We take a look at the actors, who impressed us with their performance on screen. Ram Charan Teja's second film Magadheera zoomed up the charts and emerged as the biggest success of the year. There was a gap of almost two years between the first film Chirutha and Magadheera. 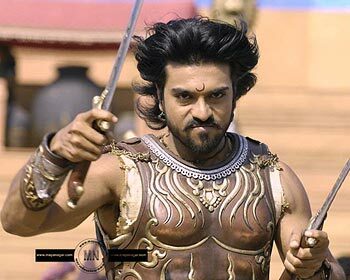 Charan, who plays two characters in the film -- the first has a period look while the second is more contemporary, wowed the audience with his performance, stunts, sword fighting, horse racing and much more in Magadheera. The film has been directed by S S Rajamouli. Charan made a nice, romantic pair with Kajal Agarwal. After the success of Magadheera, Charan is now doing Bhaskar's (of Bommarillu fame) film -- tentatively titled Orange -- with Genelia D'Souza. Ravi Teja has slowly inched his way up the charts. His uncanny sense of comedy and the ability to make people laugh has become his strength and the audience for sure knows what to expect from a Ravi Teja film. He had two releases, Kick and Anjaneyulu, this year. While Kick was a huge hit, Anjaneyulu fell short. Ravi tickled the funny bone in the first half of Kick, and was quite endearing in the second half. He was the lifeline of Anjaneyulu too. His next project is Shambo Shiva Shambo -- the Telugu remake of the Tamil hit Nadodigal -- and he is slated to do a film with Krishnavamsi. Siddharth is emerging as a bankable hero, who chooses the good script-driven films and delivers good performances. Since he's on the lookout for new ideas and thoughts, he signs new directors as they bring new perspectives to films. The best thing about him is that he has learnt Telugu and says his own dialogues. This year, Siddharth's films Koncham Ishtam, Koncham Kashtam (with Tamannaah) and Oye (with Shamili) fared decently well at the box office. In KIKK, he delivers a subtle performance as Siddu. In Oye, he teams up with Shamili, who returns to Telugu cinema as an adult star. Currently, he is working with writer-director Prakash Rao (son of K Raghavendra Rao)'s yet-untitled project with Shruti Haasan. The rebel star, as he is often known, had two films this year. The first one was Billa, a remake of the Tamil Billa, which, in turn, was a remake of the Hindi film Don. Directed by Meher Ramesh, this Billa was slick and stylish. The tall actor looked dapper in suits and shades and looked good next to a svelte Anushka. Even in his 'villager's' role he looked perfect, and spoke the dialect well. In his second outing -- Puri Jagannadh's Ek Niranjan -- Prabhas got a chance to romance Kangna Ranaut. But it failed to create magic. Meanwhile, Prabhas -- along with Gopichand -- released the music of quite a few new films, as they were considered lucky. Ram is barely out of his teens but he's still very passionate about acting. Ram's 2009 releases were Maska and Ganesh. Maska, a Sankranti release, can be remembered for Ram's spirited performance, extraordinary dance and effective action. In Ganesh, he was super-cool with the bunch of about 25 kids and when he romanced Kajal Agarwal. Surely a talent to look out for in the years to come.